American Wolf: The Day George Washington Died. Today is a day that tragedy struck in American History. 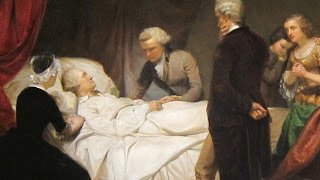 On December 14, 1799, George Washington, the Father of Our Country & the First President of the United States, passed away from a throat infection in his Mount Vernon home at the age of 69. He was the only president to both live & die in the 18th Century. Convinced he would die at a young age like all men in his family before him, Washington not only lived, but—after having several horses shot out from under him in battle—at times would wonder if he wasn't perhaps invincible. Still, he worried about a premature death. His fatal illness came about after he insisted to do his daily inspection of Mount Vernon even though it was cold & rainy (once a surveyor, always a surveyor, it seems). It's tempting to look back & say, "If only he had listened to his family & servants & stayed home that day," etc., but history has a way of making our minds up for us—if only in retrospect. Perhaps he was worried about something in particular that day; perhaps he was obsessive with his property; perhaps he sensed it was his time (or close to it, anyway) & felt he already had been living on borrowed time for too long in the first place. We'll never know the motive. But we'll never forget the result. From the sketchiest flicker of psychological shadow comes the darkest truths etched in tombstone: George Washington would die on December 14, 1799. By that point, the town of Newtown, Connecticut, had already existed for 95 years.